Kev Sanders (right) with Steve Collins at the opening of his new gym. City boxing guru Kevin Sanders has settled into a new gym at Woodston and is ready to welcome more customers. The Kevin Sanders Boxing and Fitness Academy in Alfric Square was officially opened last month by Sanders’ mate, former world champion Steve Collins. Kev Sanders and Steve Collins with some of the coaches at Sanders' gym. “We’ve got our own home now, there’s lots of room and we’re open seven days a week,” said the man who trained world champions Nigel Benn and Lloyd Honeyghan. “So what that means is we can cater for a much bigger audience. 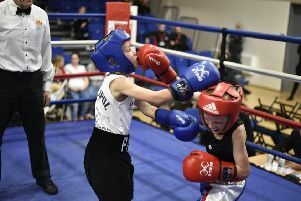 “I’d particularly like to hear from schools interested in adding boxing to their curriculum and we’ve recently introduced ladies fitness classes. “Our sessions are hard work but they are all good fun and we take time out to talk to all of our students. Sanders is also keen to improve the standard of boxing coaching in the area and is running a coaching course in conjunction with Peterborough Regional College on September 30 at the gym. For details of all courses contact Sanders on 07872 601467 or email vsanders@btinternet.com.